Cedar top, rosewood body, and ebony fretboard, all on a moderately priced yamaha classical. From Yamaha comes a beautiful classical acoustic guitar that's built with strength and design that both beginners and seasoned players can appreciate, and is offered at a great price. The Yamaha CG192C guitar is their top of the line flagship model that offers the highest satisfaction in sound quality and cosmetics. 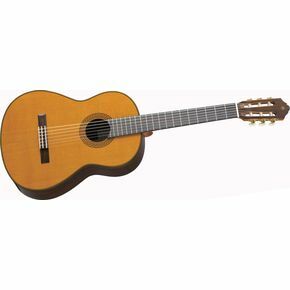 The classical guitar body produces a soft sound ideal for fingerpicking, or intimate chord progressions, thanks to its nylon strings and superior woods. The full-size classical guitar features strong mid-range and lower-mids, with emphasis on balanced tone. The end result is a guitar with lots of smooth, classical appeal, for a great price. The solid cedar top produces clear balanced tone, with a soft voice. The Yamaha guitar's rosewood back and sides add bold sound, and thick projection with lots of responsiveness. The mahogany neck of the Yamaha guitar complements these qualities and adds clarity and dynamics to a guitar with lots of dimension. Adjust your attack and sustain for each note, and the classical guitar responds accordingly. Other features of the Yamaha CG192C guitar include rosewood bridge, beautiful ebony fretboard, white mother-of-pearl peg tuners, and chrome hardware for a sleek-looking classical nylon-string guitar. Built to the precise specifications of Yamaha's master craftsmen, this classical guitar will continue to sound as good as the day you bought it. Make that day today and order now. Case sold separately.